We offer the most efficient and power dense flyback controllers that meet the demands of switch mode power supplies for various applications. What is a flyback controller? Get all of your questions answered by our experts and jump start your project with our designs. What application are you designing in? Browse through our portfolio of integrated features that provide optimized solutions for any application. This fully tested, USB power delivery reference design is a high efficiency, high power density, AC/DC adapter solution with a wide input voltage range (85 - 265VAC) for laptop adapters and smartphone charger applications. The TIDA-00702 is a 60-W, industrial AC-DC power supply designed for use in industrial and instrumentation systems such as process controls, factory automation, and machinery control. The PMP15002 is a highly efficient, universal AC input to 5V 3A output reference design for cost-optimized adapter and charger applications. 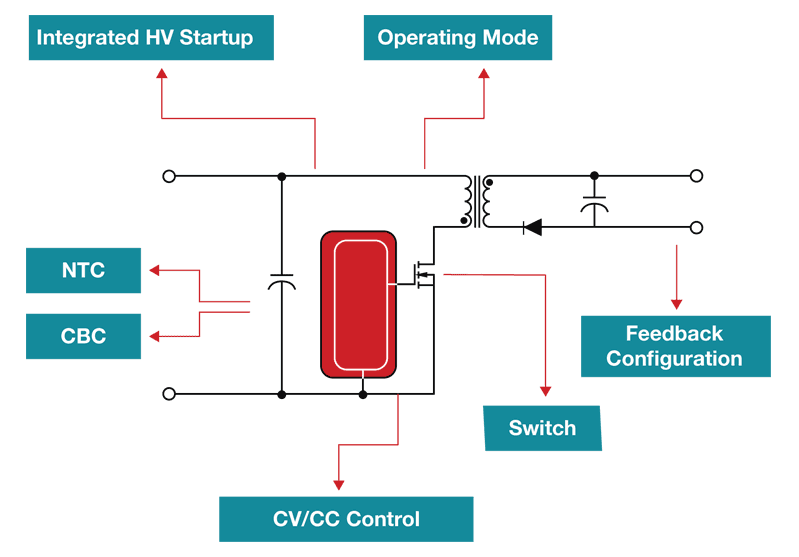 What is a flyback controller? A flyback controller is a dedicated IC that's designed to specifically regulate a flyback converter. Click the different boxes in the diagram below to read more about each feature.